Panini has ramped up its baseball card production in recent months, and the latest product to hit the market is 2013 USA Baseball Champions. USA Baseball products usually don't come in pack form, but rather in boxed sets with random hits and inserts. 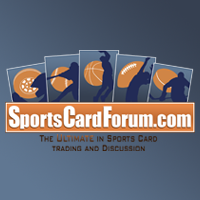 So this is definitely something new and different for those collectors who enjoy USA Baseball cards. This moderately priced product comes loaded with memorabilia and autographed content - some with players who haven't signed in a good long while too (ahem, Mark Mcgwire!). With 24 packs per box, collectors will be getting quite a bit of cards to sink their teeth into! The base cards in USA Baseball Champions come with three distinct border types - red, blue, and gold. 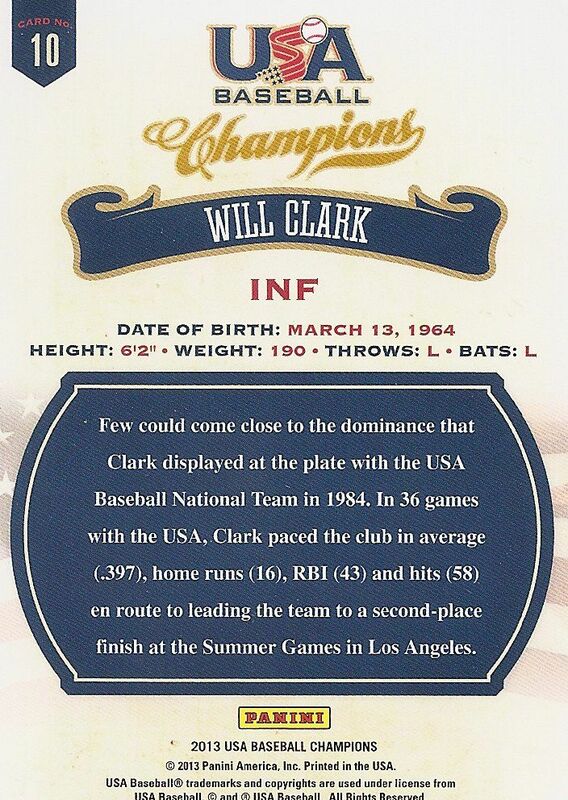 The gold bordered cards like the Will Clark shown above signifies an older star player. 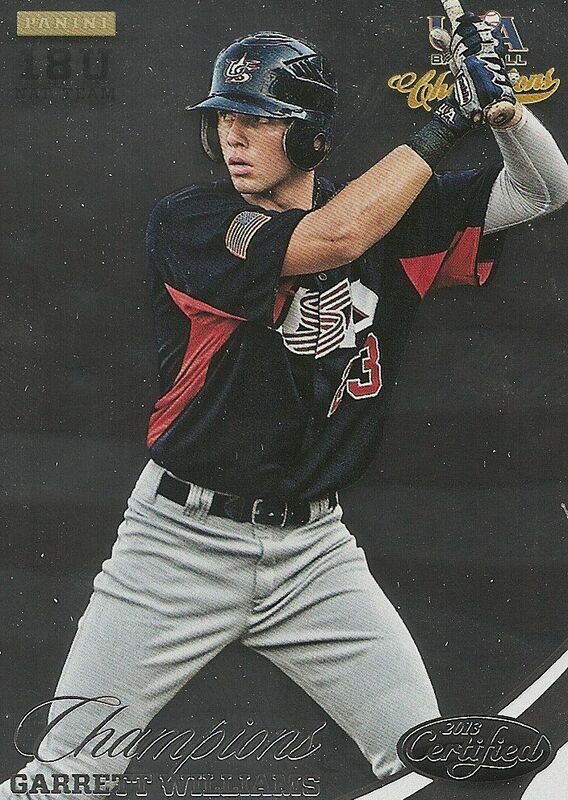 Red and blue bordered cards represent players who currently play with USA baseball or have played recently for them. Panini actually had a differentiation between red and blue cards, but because of a re-working of the checklist, that differentiation no longer exists. Besides the three different border colors, these cards have some pretty solid design elements incorporated with them. 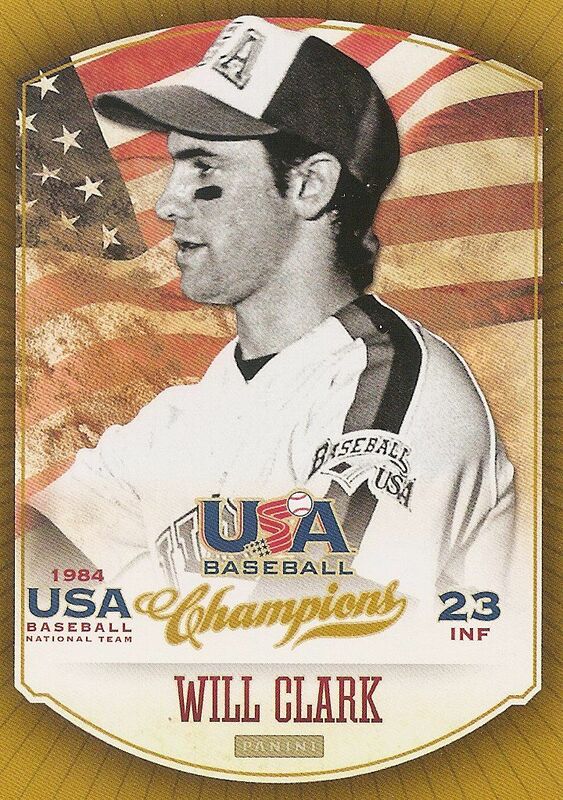 The waving United States flag in the background is the perfect backdrop for the player photos, and the fonts and color schemes all relate well to the USA theme of the set. Each card has an abundant amount of information on the front so you know when the player played for USA Baseball as well as their jersey number, position, and division of play. All these elements work to create a very nice set of base cards. I would like to add that all the photos from this set were provided by USA Baseball. They are great shots - especially the ones of the retired players. These are pictures you've probably never seen before! The back of the card is simply done. The national colors are used to nice effect and the information is presented in an uncluttered way. There are no statistics listed on the back as traditional baseball cards would have; instead there is a single paragraph write-up about the player's contribution to USA Baseball. As the sampling size of games might not be very big, this method makes a lot of sense. A few highlight cards are sprinkled into the base set mix. They may be difficult to spot because of their similarity to the standard base card, but you can easily see the difference when looking closely. 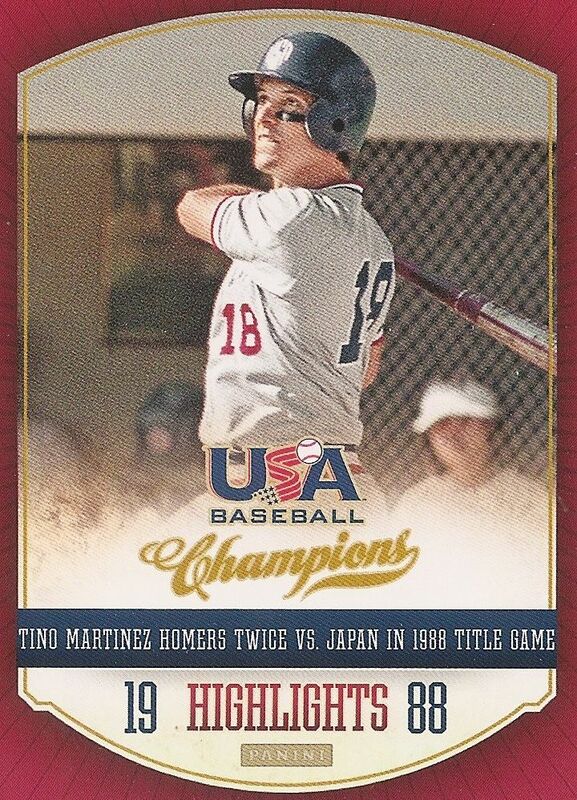 These highlight cards point out special moments in USA Baseball history. Because there are no 'rookie cards' in the set, these are an appropriate addition. I actually really enjoy these cards because they give collectors information about important events that they may have not known about before. For a product with a price point of under $70, USA Baseball Champions really gives collectors a good amount of hit content. My box contained three autographs and three memorabilia cards as well as a good portion of Certified inserts, some serial numbered with die-cuts. 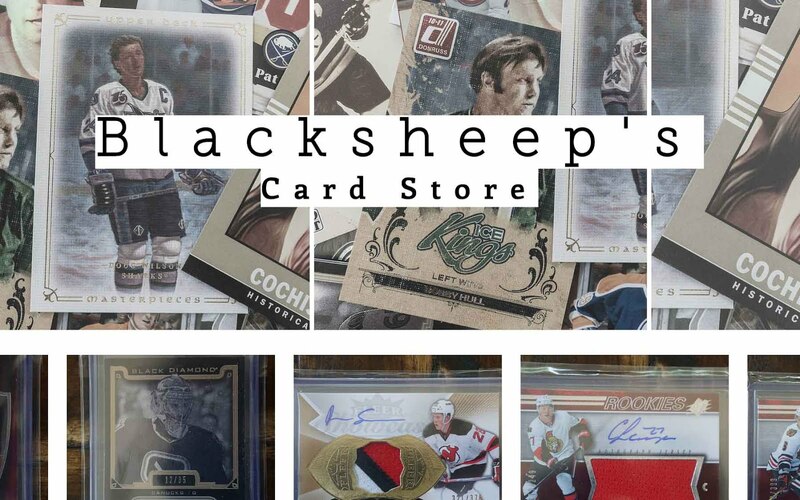 A recent trend for many products lately has been to include popular brands within newer products in order to add value and incentive for collectors to purchase it. Certified, one of Panini's most well-known and beloved brands, has been inserted into USA Baseball Champions. And it brings its signature all-foil board card stock with it. Though it's hard to tell from the scan above, the Certified inserts are more of a bright silver than a dark grey. For a better look at them, watch the box break at the end of this review. They are actually quite striking in appearance. Like the regular base cards, these have the United States flag as a backdrop. It's hard to dislike the look of these cards; they are top notch. Mirror Red parallel cards can also be found within the packs. The standard parallel cards are serial numbered to 499. More than the silver Certified cards, these Mirror Red cards have a lot of pop to them. The silver Certified cards have a flat foil finish whereas these have a rainbow foil effect when light shines on them. And to further put these cards over-the-top, these cards have a deep red foil to accent the players name as well as the brand logo. It's a stunning look that many USA Baseball fans will enjoy. Not to be outdone, Mirror Blue cards also make an appearance. 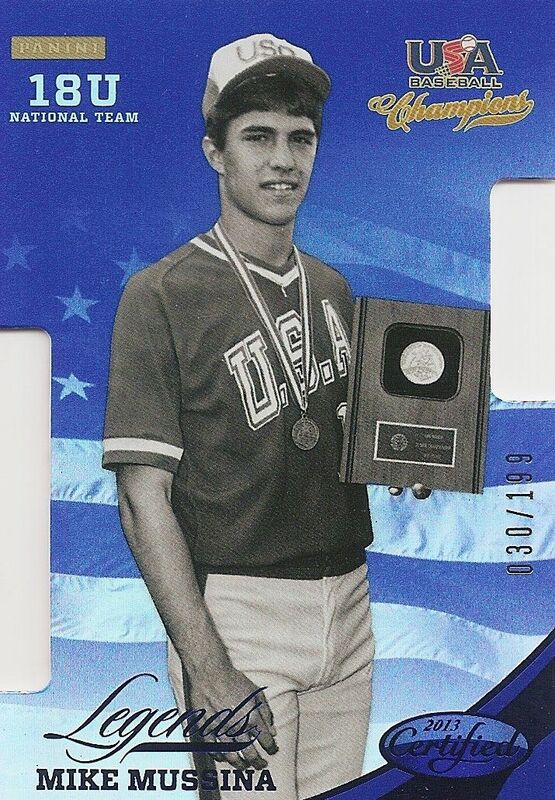 This particular one of legendary pitcher Mike Mussina is die-cut and numbered to only 199. Collectors can find a wide mix of Certified colors and cuts in the boxes they break. Gold, green, and black... they're all ready to be found! Just when you thought that the Certified inserts were just about parallels, well, they aren't. Certified autographs also come with autographs too. It's the same great look just with the added addition of a signature. I particularly like that this Adam Plutko card was signed in red ink to match the Mirror Red color. It's attention to detail like this that really stand out to me. Besides the Certified, USA Baseball Champions has its own set of inserts, game-used, and autographed content to go along with the base set of cards. 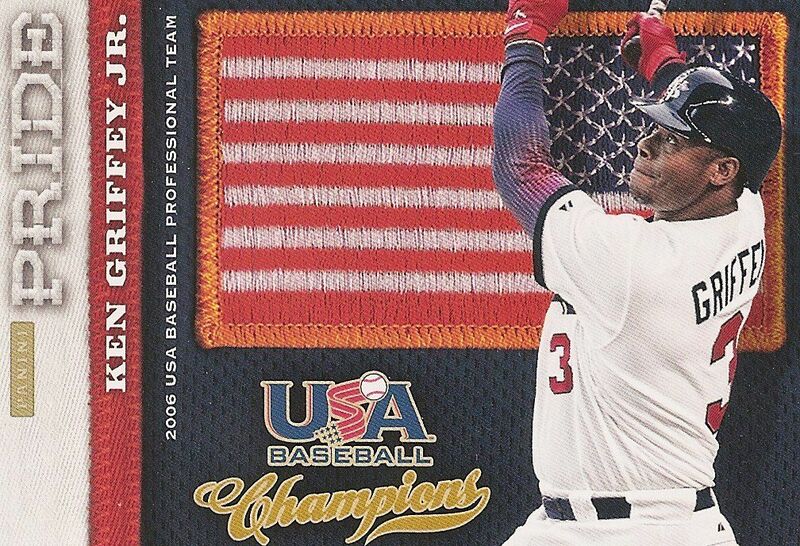 The Pride insert of Ken Griffey Jr. is an example of a USA Baseball Champions Insert. You can tell that it is related to the base cards by the color scheme used. You might have noticed that the United States flag on the card is backward. This was not an oversight by Panini. 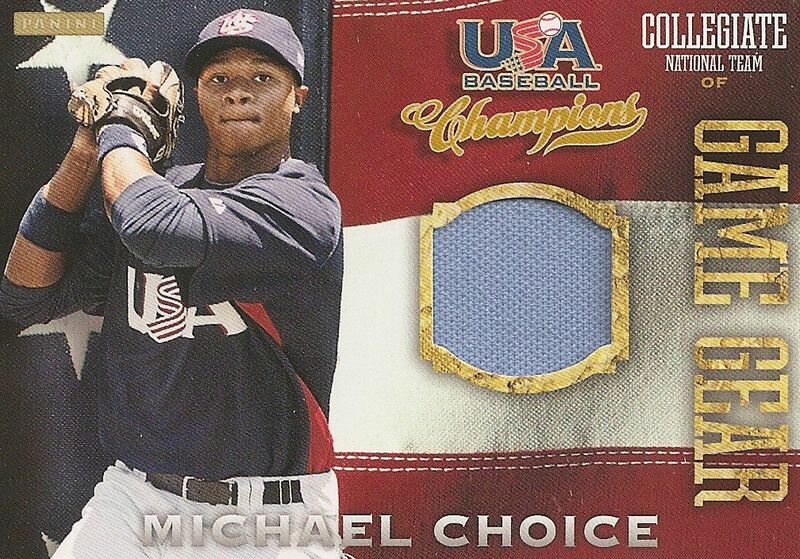 These cards were intentionally made this way to represent the way the flag looks on the USA Baseball uniforms. It's not a mistake and it's not trying to be disrespectful. 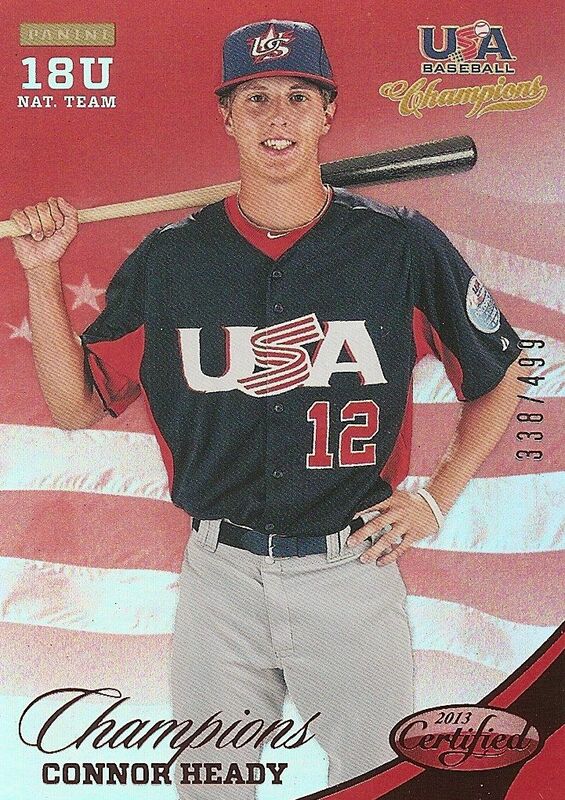 It's Panini staying true to how things are done in USA Baseball. In fact, this backwards American flag patch is not only used in USA baseball, but by the United States military as well. 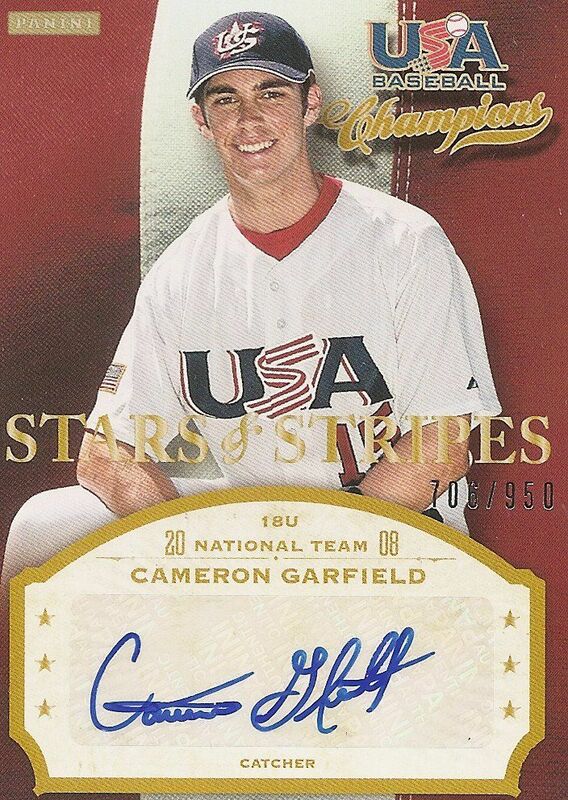 Stars & Stripes is the name of the autographed set in USA Baseball Champions. Though these are simple thin-stock sticker autographed cards, they have one major thing going for them - serial numbering. So often autographed cards of this ilk are unnumbered; by simply adding serial numbering to them, I believe their desirability goes way up. Interestingly, the two Stars & Stripes that I pulled in this break had different print-runs. The Cameron Garfield shown above was numbered to 950. Another auto, Nick Castellanos, was numbered to 573. Game Gear is the name of the memorabilia set in USA Baseball Champions. You may think that the flag background has gotten old by now... but it hasn't! These cards have a much closer view of the flag represented on their face as compared to other cards in the set. It's a beautiful look that again just works perfectly. Though the Michael Choice (and my other two shown in the video) is only a single jersey swatch, more fortunate collectors will pull out prime pieces, bat pieces, and even bat knobs! Wow. It'd be pretty amazing to get a knob out of this product, wouldn't it? 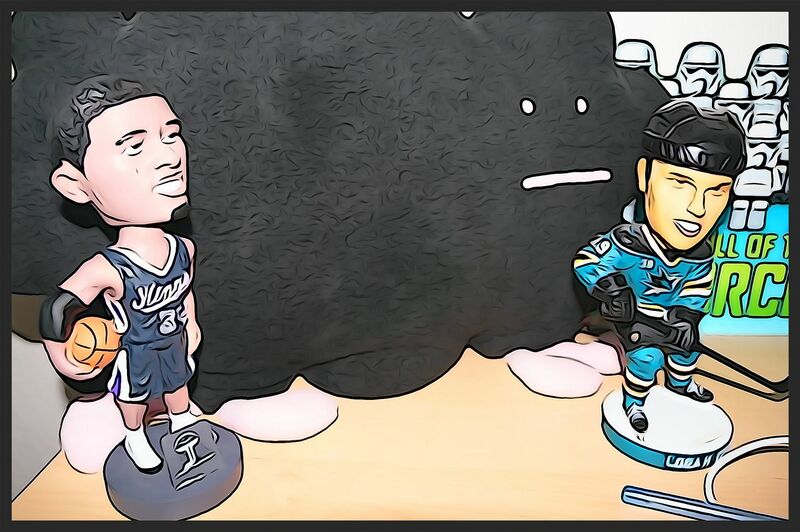 I think Panini has a real sleeper of a product here. Since Panini doesn't have an official baseball license, they have been producing many cards without MLB team logos... and doing a pretty good job of it. With USA Baseball Champions though, they don't have to do that! They are licensed to produce these cards so they can show players in their full USA gear. It's really cool to see what Panini can do with full licensing support in baseball. USA Baseball may not have as huge of a following as the Major Leagues, but USA Baseball fans are a strong group of collectors. I am sure that they will fully enjoy this product, especially because Panini has included some very marquee names into it. Players like Mark McGwire, Will Clark, and Ozzie Smith have all signed cards in it. With the price per box being well under $100 and packs for under $4, this is something that just about anyone can purchase - even just to try out. 2013 USA Baseball Champions is a tremendous value. I recommend you give some a shot! Let me know what you thought of 2013 USA Baseball Champions in the comments section. I'd be especially interested to see what you get from it. Another great product by Panini. The base card design is very sleek. The colours blend well together. The lettering is bold and very easy to read. The insert cards are very nice as well. All the colours go with Red White and Blue. The gold edges work well with the cards it gives it a classy touch. The autograph card with the plaque on it looks amazing, makes it look like a very high end product. Overall I will give this product an 8.5/10. Love this product. Really like the combination of current and past USA stars. I love most USA baseball products and this is the best one I've seen. All of the cards you pulled looked great. Panini did a really good job producing value back into this box. Great review! I am a big baseball fan on a budget for cards! This has great value for my money so I might give this box a shot in the future! Great video and review Blacksheep! I think this is a great product. The design is clean and you can get tons of great players. First off, I must say, I don't like how the cards are cardboard... Let me rephrase that. I don't like the over-exaggerate cardboard look. Maybe I just don't like know my prized possessions are cardboard. I do like the patriotic act that has been put to the product. I am Canadian but that doesn't mean I don't like the representation of countries. I also enjoy the unpredictable factor to the product. Sometime, before I buy a box, I don't look at the breakdown of the product so I can get surprised. This product can really do this to you. I found the advertising a bit of a stretch. If you opened a box you have already invested you money in something, clearly. The again, how else do we advertise... Perhaps I am not making sense but the bottom line is, I find it strange. I am a fan of the amount of hits that come in the product. That is always exciting. It brings much more joy to the box breaking, I find. Finally, I love that red-ink auto on the certified card. That was just sweet. I thought I'd point that out. I think Panini and Upper Deck should have players sign in all sorts of colors. I think that would be neat. Overall, I enjoyed this product thoroughly. It was very nice. Thanks a lot for another great review look. 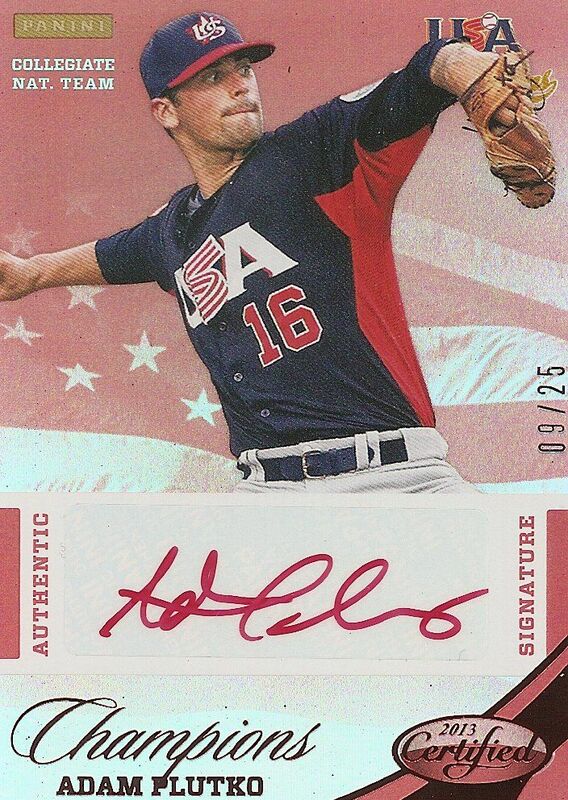 USA baseball 2013 is a good looking product with a bunch of coll inserts and the autographs are looking really nice I would get this product but I believe it is only in the US not in Canada. also I am really liking your Nick Castellanos auto he id going to be pretty good. The design and value really seem to be there, especially with the amount of hits per box. The red ink auto looks awesome and the jersey cards look like a older classic design. Why not making the whole product with the "Certified"-design? Those cards looks very similar to it's sports colleagues, but it's such a great and the special USA parallells are really sweet looking. The rest of the Product design isn't that exciting, and sure you get a whole amount of hits for your Money but I would have loved to see even more Certified!